Accory offers wide selection of identification tags for various applications. Such as workshop key tags, luggage tags, lockout tags, parking permit tags and more. Custom shapes or imprint is available. The arrow shape Vinyl Workshop Key Tags make labeling Keys fast and easy. Identification arrows for the traceability of food products thus guaranteeing quality, freshness and origin. Parking Permit Tags are used for event parking; such as, sporting events, band, booster clubs and special functions, and as Keepsakes or mementos of the event. It is designed to hang from your car’s rearview mirror. Lockout Tags keep workers from mistakenly turning on equipment. They allow authorized personnel to lockout and tag equipment for servicing or repair. Be sure to never lose your bags with this great budget luggage tag. 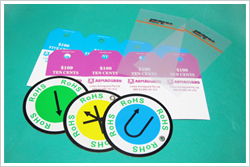 The round tags are designs to control material meeting the requirement of ROHS in the producting process.